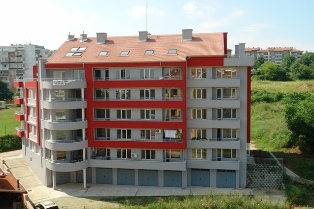 We present you a new- building in one of the largest residential district of Ruse town-`Dryjba`. This two-bedroom apartment is with large terrace of 85 sq.m and a magnificient panorama to the town. a kitchen with dinnig room,and two terraces. The apartment is with inner doors MDF,security door and PVC windows `Veka`.The terraces are with metal parapets and granite tiles. The facade of the building is with thermal insulation and crawl shared section are luxury done. 1.Two-bedroom apartment with size of 90 sq.m-price 36 500 Euro. 2.Two-bedroom apartment with size of 100 sq.m-price 34 500 Euro.